Do you need more precise measurements over a broad range? Or multiple measurements at the same moment for process control? AvaSpec multi-channel spectrometers fulfill your every need. You can select from our range of spectrometer detectors, choose different slits or gratings: anything is possible. Two enclosure options are available: the 9” desktop housing for up to 4 channels and the 19” rack-mountable which holds a maximum of 10 spectrometers. For or USB2 version all channels are connected to the computer through a single USB2-cable. For the EVO series a USB3 and a Ethernet version is available. The Ethernet version (ETH) supports standard 4 channels. With the additional hub installed, it can handle up to 10 channels. AVS-DESKTOP-USB2 Desktop for USB2 platform multichannel AvaSpec, incl. channel synchronization, USB2-hub and 100-240VAC power supply, supports max. 4 Rack-mount spectrometer units. AVS-RACKMOUNT-USB2 19” Rack-mount for USB2 platform multichannel AvaSpec, incl. channel synchronization, USB2-hub and 100-240VAC power supply, supports max. 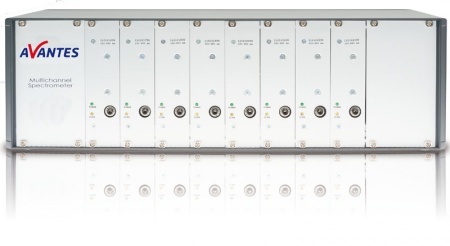 10 Rack-mount spectrometer units. AvaSpec-DDDD-USB2-RM Rack-mount Unit USB2 Fiber-optic Spectrometer, self powered high-speed USB2 interface, incl. AvaSoft-Basic software, USB cable and sync cable, specify detector type DDDD (128/ULS2048/ULS3648/ULS2048L/ULS2048XL/NIR256/512), grating, wavelength range and options. Desktop/Rack-mount needs to be ordered separately. AVS-RACKMOUNT-EVO-USB3 19” Rackmount for USB3 platform multichannel AvaSpec-EVO, including channel synchronization, USB3-hub, one DB26-IO connector and 100-240VAC power supply, supports max 10 rackmount unit spectrometer channels. AVS-RACKMOUNT-EVO-ETH 19” Rackmount for ETH platform multichannel, including channel synchronization, 4 channel ETH-hub, one DB26-IO connector and 100-240VAC power supply, supports max. 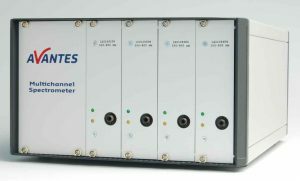 10 rackmount unit spectrometer channels (needs AVS-RM-ADDON-5-10ETH).